Summary and Definition: The first Ghost Dance movement was initiated in 1870 by Wodziwob, of the Paiute Indian tribe, who experienced a vision and prophesized that a disaster would eradicate the white man and that dead ancestors would return to the land of the living. The first movement failed, but a second movement emerged in 1888 led by Wovoka who experienced another prophetic vision during a solar eclipse. In order to realize the vision, Wovoka directed his followers to perform a traditional circle dance in a series of 5 day gatherings. The Ghost Dancers wore special symbolic clothes featuring the morning star symbol combined with the symbolic power of crow and eagle feathers. 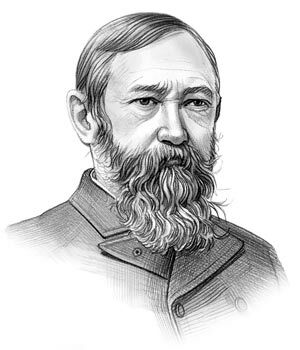 Benjamin Harrison was the 23rd American President who served in office from March 4, 1889 to March 4, 1893. One of the important events during his presidency was the Ghost Dance movement. Ghost Dance Facts for kids: What was the Ghost Dance? The Ghost Dance was a religious and symbolic ritual performed during the late 1800's by members of the tribes of the Great Plains. Two Medicine Men (Shamans), had experienced prophetic visions and that by performing the Ghost Dance the spirits of the deceased would re-unite with the living and bring peace and prosperity to Native Indians. Many Native Americans believed that "When we dance, every time our foot hits the ground, it is a prayer". The 'Round Dances' were representative of the circle of life. The picture of the Ghost Dancers depicts many eagle and crow feathers - feathers symbolized honor & connected the user with the Creator. Eagle feathers were the symbol of great strength and courage. The bald eagle was considered sacred bird. The crow symbolized wisdom and was a symbol of the past, when the crow had acted as a pathfinder. Ghost dancers flourished crow and eagle feathers and wore them in their clothes and hair. The Ghost Dance Religion used the morning star as a symbol of the renewal of traditions and the resurrection of the heroes of the past. Interesting facts about the Ghost Dance are detailed below. The history of Ghost Dance is told in a factual sequence consisting of a series of short facts providing a simple method of relating the history and events of the Ghost Dance. 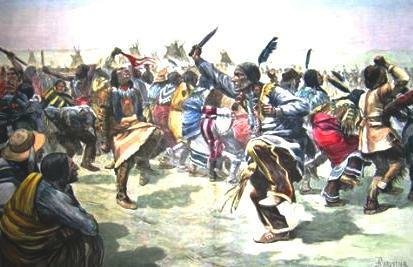 Ghost Dance Fact 1: The first movement was initiated by Gray Hair, or Wodziwob, of the Paiute tribe. The movement began in 1870 in the Walker Lake Reservation in Nevada. Ghost Dance Fact 2: Wodziwob experienced and apocalyptic vision in which a great disaster caused by fire or flood would eliminate the white man, that deceased Indians would return alive to the earth to support the tribes and the buffalo would be restored. Ghost Dance Fact 4: Gray Hair, or Wodziwob was followed by a Shaman called Tavibo who spread the prophecy and new doctrine among other Native American tribes of the Great Plains. Ghost Dance Fact 5: The first movement initiated by Wodziwob and spread by Tavibo subsided when the prophecy failed to come true. Ghost Dance Fact 6: The second movement began in 1888 and was initiated by Wovoka who was Tavibo's son. Wovoka had been trained as a medicine man, or Shaman, by his father. Ghost Dance Fact 7: Wovoka (1856 - 1932), also known as Jack Wilson, became highly influential amongst the tribes as a powerful Shaman who had strong magical and mystic powers. Ghost Dance Fact 8: During the solar eclipse on January 1, 1889 Wovoka had a prophetic vision in which he saw the resurrection of the dead and the return of the whites from North America to their original homeland. Ghost Dance Fact 9: Wovoka taught that in order to realize the vision, the Native Indians must live righteously and perform a traditional circle dance in a series of 5 day gatherings. The philosophy of the Ghost Dance and Wovoka was of peace and he asked his followers to "do no harm to anyone, do right always...do not tell lies...you must not fight". Ghost Dance Fact 10: The arrival of the railroads and the policies and laws of the US Government had brought a massive influx of settlers into former Indian lands. The once numerous herds of buffalo were being wiped out as a sporting activity of white men. Tribes had been forcibly relocated to reservations, thousands of miles from their homelands. Treaties and promises had been broken. The info about the Ghost Dance movement provides interesting facts and important information about this important event that occured during the presidency of the 23rd President of the United States of America. Interesting facts about the Ghost Dance are continued below. Ghost Dance Fact 11: The prophecy of Wovoka quickly spread words of hope among many Native American tribes, notably the Lakota Sioux and other tribes of the Great Plains, and the number of Ghost Dancers increased in number. Ghost Dance Fact 12: The Lakota Sioux leaders, Grant Short Bull and Kicking Bear, believed that although Wokova had preached against fighting that militant action would hasten the removal of the white settlers. Ghost Dance Fact 13: By 1890 the U.S. authorities became fearful of the movement’s rapid spread and tried to outlaw the rituals of the dancers who had started to wear specific clothing with strange, mystical symbols. The Lakota Sioux asserted that the ghost shirts were bulletproof. Ghost Dance Fact 14: Memories of the 1876 Battle of Little Bighorn surfaced and the crushing defeat of the 7th Cavalry led by General George Custer at the hands of Chief Sitting Bull and his combined force of Sioux, Cheyenne & Arapaho Native American Indian tribes. Ghost Dance Fact 16: The arrest of another Lakota Sioux leader, Chief Spotted Elk, aka Big Foot, was ordered. Chief Spotted Elk led his followers to the Pine Ridge Reservation hoping to find safety. Ghost Dance Fact 17: On December 28, 1890 Chief Spotted Elk and his followers camped near Wounded Knee Creek and were soon surrounded on all sides by soldiers. Chief Spotted Elk had not intention of fighting. The soldiers started collecting their weapons. Ghost Dance Fact 18: According to some accounts, a Shaman named Yellow Bird began to perform the Ghost Dance. A gun accidentally went off which led to the Massacre at Wounded Knee in which nearly 400 men, women and children of the Sioux nation were killed. Ghost Dance Fact 19: The Massacre at Wounded Knee effectively ended the movement. Two weeks after the Wounded Knee Massacre all other Ghost Dancers surrendered to the US Army. Ghost Dance Fact 20: The surrender brought an end to the Movement and the hope of the Native Indians to return to their traditional way of life. The article on the Ghost Dance provides detailed facts and a summary of one of the important events during his presidential term in office. The following Benjamin Harrison video will give you additional important facts and dates about the political events experienced by the 23rd American President whose presidency spanned from March 4, 1889 to March 4, 1893.